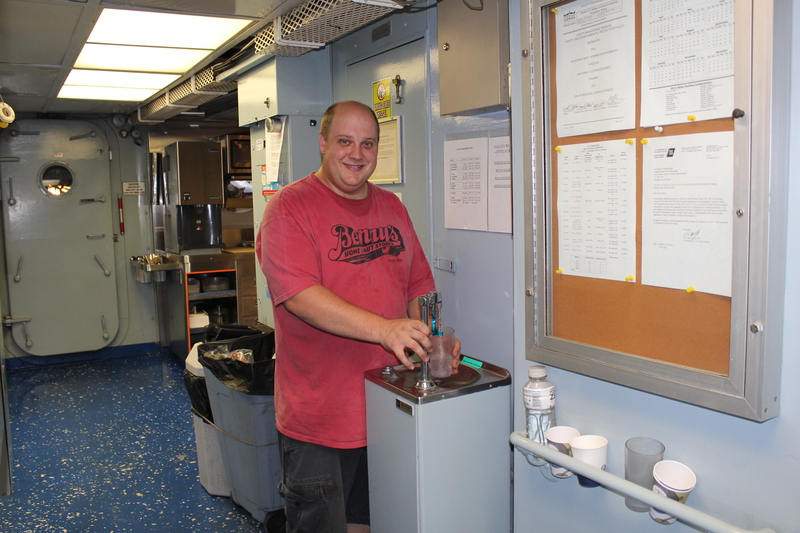 After our deployment of the CTD this morning, followed by GO-Flo and In-Situ Pump number 13, George Maltby, Endeavor’s Assistant Engineer, was kind enough to give me a tour of the water treatment facilities on board the Endeavor. A couple of things surprised and impressed me about the systems on board the Endeavor. If you’ve ever wondered how boats at sea can carry enough freshwater to stay out for weeks or even months, wonder no more. They don’t. At least the Endeavor doesn’t. To maintain their freshwater supply, the crew of the Endeavor turns to the ocean. Through the process of distillation, the Endeavor is able to turn salty undrinkable seawater to water that’s more pure than Zephyrhills. 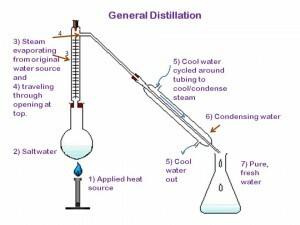 Distillation is a process that’s very simple in idea, yet difficult to maintain because of its high energy demand. 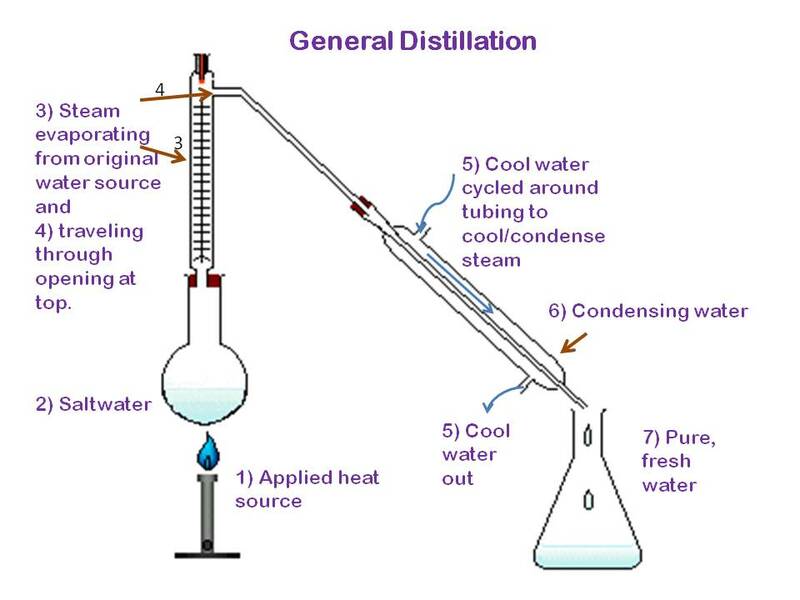 It takes a constant heat source in order to maintain distillation. The Endeavor turns a heat source that may otherwise seem like an annoyance into an advantage. The engines that move this massive ship produce a large amount of heat as a result of burning the fuel that makes its engines run. The distillation system takes advantage of that heat’s energy to provide a constant supply of freshwater for the people on board. Distillation works pretty simply. Imagine a closed contained with salt water inside of it. Now imagine you’ve lit a fire underneath that container of water. What do you think would eventually happen to the water inside of the container? It would start to boil and turn into steam. If the container were open to the air you would lose that steam to the atmosphere. If the container were closed you would trap the steam inside. Distillation is a compromise. It’s a closed container with a small opening that’s attached to piping or tubing that leaves out of the chamber. Once the water starts to evaporate and turn to steam it has a place to go- through the tubes. Once it reaches the tubes a cool-water source along the outside of the tubing cools the steam down and causes it to condense on the inside of the tubing. At the other end of a tube is a collection container waiting to catch the freshly condensed water. While the water boils and turns into steam, salt and other impurities get left behind in the original container, leaving only the H₂0 molecules to evaporate and pass through the tubing. Generally this process is difficult to maintain because of the heat that’s needed to boil the water. It would take a lot of resources (fuel in the form of wood, gas, or some other form of energy) to maintain that heat source. Since the Endeavor already has a steady supply of heat from its engines, it uses that heat to boil the water. BUT, there is one more innovative technique that the Endeavor’s distillation system uses that reduces even further the amount of energy required to make its water. Normally water boils at 212° F. If you’ve ever tried to boil a large pot of water you know that it can take a while, and a lot of energy, to get that water up to a boil. Next time you purchase a store-bought cake mix (or other type of boxed food), notice on the cooking directions that there may be a note for preparation at higher altitude. That’s because it requires less heat to prepare the food at higher altitudes because there is less atmospheric pressure (caused by gas particles pressing down on the water), making it easier for the water to boil. If you go up into a high mountain, the boiling point doesn’t change by much, but it does decrease slightly. So as the pressure on the water goes down, the less energy is required to boil it. The Endeavor is obviously at sea level, so decreased pressure is not naturally going to occur. BUT, we can artificially create that lesser pressure. The seawater gets put into a container that not only holds the water, but is a vacuum as well. Vacuums work by removing particles of gas from the air, creating a lack of pressure. Once the vacuum is created the seawater can be boiled at temperatures as low as 130° F! So not only is the Endeavor recycling heat created from the use of the engines, but it’s requiring less of it in order to get the job done. The distillation equipment here can distill up to 120 gallons/hour, making over 2400 gallons per day! That’s typically much more than the Endeavor consumes in a day. Water continually gets made on board the Endeavor, and extra water is dumped back over into the ocean. Water quality is checked throughout the process and it measured in ppm or parts per million. Parts per million is almost like per-cent, only its per-million. A substance measured in a percent would have a much smaller ppm. For example, 10% salt solution means that for every 100 grams of water, 10 grams are salt. A 10 ppm solution means that for every 1,000,000 grams of water, 10 grams are salt. The latter solution would be much more diluted, having less salt per amount of water. The distillation methods onboard the Endeavor produce a product that has less than 1/10 ppm dissolved material! That’s very pure water. The only single downside to this whole operation is that if the engines are not being run very much, they will not generate a good deal of heat, making distillation impossible. For those times the Endeavor has a secondary process to make freshwater. 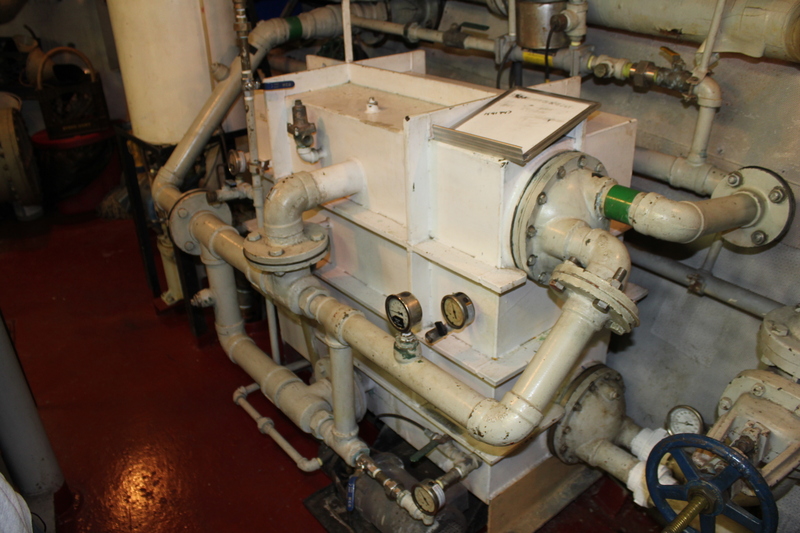 The second way that freshwater is made on the Endeavor is through a process known as Reverse Osmosis. Osmosis works on the basis of pressure. It only makes sense that liquids will move from areas of high concentration to areas of low concentration. Imagine you put a peeled potato in a bowl of water. Inside of the potato there are lots of water molecules, and outside of the potato there are even more particles of water. Since the concentration of water on the outside is greater than the concentration on the inside, water will move from the outside of the potato (the bowl) towards the inside, causing the potato to swell as its cells become filled with water. The system on the Endeavor works in the same way. Seawater has a lesser concentration of water than freshwater, since some of the seawaters space is taken up with salt. A gallon of seawater has less water molecules than a gallon of freshwater. If you were to put the two side by side, separated by a material that can let water through (like a filter), the water would move from the freshwater source to the saltwater, causing the saltwater to become very diluted. If that happened we would call the process osmosis. But the Endeavor utilizes reverse osmosis. We start out with seawater and end with freshwater. The seawater is placed inside of a chamber that is lined with a “membrane.” A high amount of pressure is applied to the inside of that chamber which causes the water to be pushed out of the chamber and into an awaiting container while the salts and other impurities stay behind trapped by the membrane. It’s basically filtration on a really fine scale. This type of filtering produces water that has a purity of about 340 ppm. Although it seems much lower than the purity of distillation, the water produced is of drinking quality. This system is capable of producing about 50 gallons of water/hour. Between the two mechanisms on board for creating freshwater, the Endeavor can maintain its supply of water indefinitely as long as it have fuel in its engines and saltwater over the sides. Now that I understand where our freshwater comes from, time to shower! Thanks for following.